The survivors are split into two teams for the Reward Challenge, crossing obstacles in the ocean and then retrieving rings. The winners get to trip to the Chocolate Cafe AKA Product Placement City. Everyone gets a single M&M as inspiration to fight for a prize of Snickers. One whole M&M! Probst spoils them, though everyone plays into this moment of ecstasy with their most exaggerated looks of delight. The survivors are wet and slippery so of course there's lots of face plants down platforms and squeaky slips. Will's wonderful slip, fall, whatever has become my go-to GIF of the week. In a big comeback, Mike, Dan, Tyler, Shirin, and Sierra win their chocolate fix. Snickers, Twix, Dove, M&Ms, and more - it's like a melted chocolate dream come true. Back at camp, the losers decide to kill a chicken because it's almost as good as a Twix bar (I'm lying. Chicken won't cue your Twix fix). Rodney uses this time to charm everyone (me included!) with his phenomenal Mike impression, which cracks everyone up and shows that maybe the alliance isn't as tight as assumed. 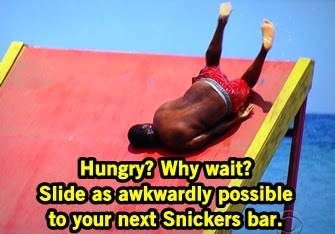 It's definitely true as Rodney has been pondering when the best time to flip on his alliance, explaining that flippers can win, they just have to flip at the right time. Jenn is the Debbie Downer at camp, sad and lonely after the tribe voted off her BFF Hali. She hates who she lives with, doesn't want the chickens slaughtered, and is ready to bid adieu to the game. Set on leaving, Jenn tells Joe that if she wins the immunity challenge she'll give him her necklace. The Immunity Challenge is for the survivors to balance on their tippy toes with a block on their head, keeping that block steady against the top of the contraption they're standing on. It's a great endurance challenge, requiring some physicality but also a mind-over-matter concentration. 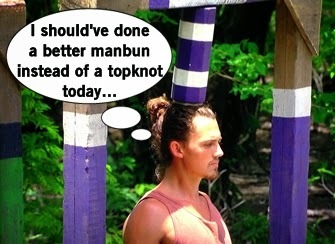 Joe's manbun needed to be a little lower, as he loses his first individual immunity challenge. Tyler, Mike, and Jenn are the final three, so Probst reminds us it's fitting to have one of each collar left (not really). Jenn is so close, but Tyler wins individual immunity. Joe is sure he's going, but a plan masterminded by Shirin would help Jenn get her way to go home. Since the big seven will probably split the votes out of fear of an idol, Shirin will vote to force a tie between Joe and Jenn and get her out of the game. Mike hopes Shirin will vote their way and allow the biggest thread to be eliminated, which Shirin really ponders since she's started to make ins with Mike and Sierra for a new alliance. 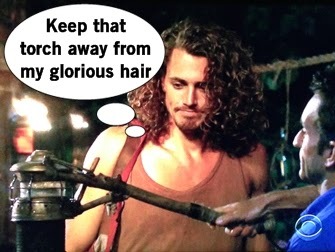 To hopefully keep the votes away from him, Joe runs out into the woods pretending to search for the idol but instead hand-crafting a fake one - and it's so good looking! Joe's real-life profession of a jewelry designer has never been so handy. Joe haggles with Mike: make the votes go my way and I'll give you the idol. Mike proposes something different: give me the idol beforehand and I will switch. While Mike has the idol from Joe's clue, he considers that it's always possible that Joe possesses one of the billion other hidden idols from pre-merge. Tribal Council time! Jenn does enjoy being there, but also hates it. She admits she would've given individual immunity idol to Joe just to piss the others off. "I want to be here. I want to play." Joe says, pointing out that Jenn wants to quit and could get dragged along just because she's not into it. Jenn insists she's not quitting, nor would she quit because she's not a quitter even if she's asking to be voted off. Before the voting, Mike asks Probst if he can verify an immunity idol. The answer is no, because it could impact the game (and in the best way possible). 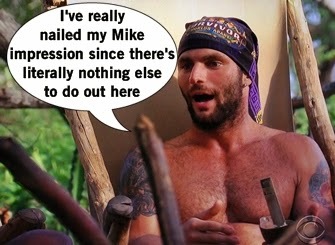 After the votes are cast, Mike does play the "Hidden Immunity Idol" for Will - except it ain't real. Sadly the plan doesn't pan out and the beautifully coiffed Joe is out of the game.